Wow Amy this card is simply stunning! I love your coloring! Pencils are so much fun to use!! You colored the pears so lifelike! The leaves and blooms are gorgeous too! A beautiful sketch too and such pretty papers! The weather here hasn't been much better either. The storms here in IL have been really bad, but not as bad as in some part of the country. It really takes the fun out of spring. What beautiful pears!! They look so yummy on your gorgeous card! I'm sorry you're having such a wet and cold spring! I hope it warms up for you really soon! 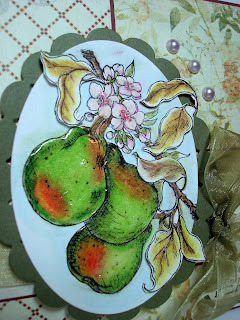 Thanks so much for joining us for the Flourishes Timeless Tuesday challenge! Gorgeous Amy, your colouring rocks as far as I can see! Beautiful image and layout! Wowsers Amy! Your pears are absolutely beautiful! I feel like I could literally pick one off of the card and eat it! Gorgeous card! Thanks for joining us for the "From the Garden" challenge this week at Flourishes!